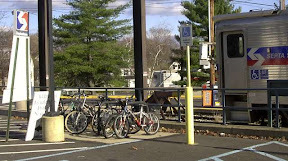 According to the July 28 Intelligencer the Borough of Doylestown is considering an ordinance to require the inclusion of bicycle racks for all new commercial buildings or an existing building that changes its use (i.e. store to restaurant). The article also mentions that the borough will continue to encourage bicycling in its quest to earn a Bicycle Friendly Community designation. Plans include "Share the Road" signs, a youth cycling education program, a “Bike to Work” day event and an annual community bike ride.